Levi Jones and Audrey Hannahs after being crowned Homecoming King and Queen on Oct. 13. Not much has changed for Levi Jones and Audrey Hannahs in the halls of Hayes High School since they were crowned Homecoming King and Queen two weeks ago. Jones and Hannahs, who have been together for two years, are proclaimed by their fellow classmates as the reputed “cute couple.” When their friends started saying that they were nominating them for Homecoming court, they assumed it was a joke. Even when they were nominated to the final 10 of Homecoming court, they didn’t take it seriously. “I was like, ‘oh, we’re on the thing,’” Jones said. “I didn’t know people thought highly of us like that,” Hannahs said. Hannahs said she took it a little more seriously when they were nominated for the final five, and took it very seriously when their names were called as the winners. Since their coronation, the couple said they’ve had lots of people congratulate them. “There’s been a lot of congratulations and ‘I’m so glad you guys won,’” Hannahs said. 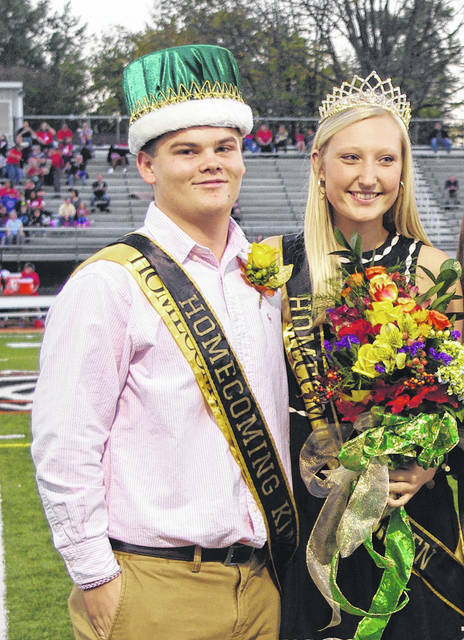 Hayes Principal Dr. Ric Stranges said Jones and Hannahs were a fine choice for Homecoming royalty.